Jeffrey Welch's Blog: Dog Feeding Schedule: How Many Times a Day Should I Feed My Dog? The post Dog Feeding Schedule: How Many Times a Day Should I Feed My Dog? by Dogster HQ appeared first on Dogster. Copying over entire articles infringes on copyright laws. You may not be aware of it, but all of these articles were assigned, contracted and paid for, so they aren’t considered public domain. However, we appreciate that you like the article and would love it if you continued sharing just the first paragraph of an article, then linking out to the rest of the piece on Dogster.com. Have you ever thought, “How often should I feed my dog?” Dogs thrive on routine and, though they do not keep track of time like we do, their circadian rhythm, or internal clock, makes it possible for them to tell when it’s close to the time for a routine task. Whether you’ve just adopted a dog (congrats!) or are wondering about how much to truly feed your pup, we bet you’ve thought, “How many times a day should a dog eat?” at some point. We’ve compiled a dog feeding schedule for adult dogs, puppies, senior dogs, active breeds and sedentary breeds, configured around each dog’s play, activity, sleep and water schedules. Remember: Any dog feeding schedule is just a suggestion. The best way to plan a dog feeding schedule is to consult with a vet, who can configure a course of action that’s customized to your dog’s needs. What is a good sample dog feeding schedule? Photography ©Chalabala | Thinkstock. 7:00 a.m. – Clean and fill bowl half-way. Noon – Rinse out and refill half-way. 6:00 p.m. – Rinse and fill half-way. Bedtime – Clean and fill bowl about ¼ of the way. See: How Much Water Should a Dog Drink a Day? Sleep: An average dog sleeps about 14 hours a day. Unlike humans, they sleep for shorter times more frequently. A dog’s REM cycle is more active than a human’s and may explain the phenomenon of “chasing in their sleep.” If your dog sleeps more than 16 hours a day, it is wise to check for any illness. By scheduling his activities throughout the day, you will naturally create a good sleeping routine. Together Time: A dog feeding schedule isn’t the only thing you should establish. Together time is a bonding experience for you and your dog. This is the easiest thing to schedule as it can be on the couch while watching T.V. or outside reading a book, or on the bed at the end of the night. The key is to focus on your dog and pet and massage him. Dogs love a light massage and many are happy with your foot stroking their back. Even just sitting touching your dog is a bonding activity. Outside around noon after second feeding. Food: A puppy will ideally eat three times a day so schedule in a feeding around noon. Get a dog sitter to help if needed. Sleep: A puppy sleeps more than an adult dog, averaging about 16 hours a day. But some will sleep for up to 20 hours! Activity: A puppy will have bursts of energy and then flop down where he is and sleep. Try to get your puppy out as much as you can, starting with short walks and building up to 20 minutes. Food: A good dog feeding schedule for senior dogs is feeding twice a day. 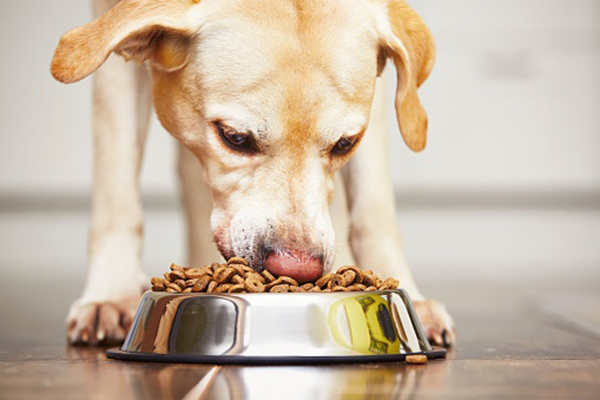 Feed senior dogs smaller amounts since their activity is limited. Water: Older dogs may need more water than their younger counterparts. Sleep: A senior dog will sleep more than an active adult dog, on average 16 to 18 hours a day. Just like humans, the older a dog gets, the more his needs resemble that of a puppy. Activity: It’s important for a senior dog to still get walks and mild activity. Ideally, you, or a sitter, could take your dog out three or four times a day for shorter walks. Avoid excessive activity and any rough play such as at dog parks. There are a few modifications on a dog feeding schedule for active dog breeds such as the Border Collie, the Vizsla and any Terrier. Sleep for these dogs is often less than an average breed and you will find they are usually running around even when dozing. It can help to feed these breeds three times a day because their metabolisms are higher. Breeds that are very large such as the Mastiff and the Great Dane tend to sleep more than an average sized dog. Some of the large breeds, such as the Greyhound and many of the hounds, do as well. A sample dog feeding schedule is also often different with these types of dogs being fed only once a day since they are not burning off as many calories. Every dog is unique and you may have to alter your dog’s feeding schedule depending on your dog’s activity level. You also may need to adjust your dog’s schedule to meet yours. The things to keep in mind are that a dog will need something scheduled every two – four hours, whether feeding, activity or playing. And consistency is key to keep you on schedule and your dog happy. Tell us: What dog feeding schedule do you follow? How does your dog’s feeding schedule correlate to his activity, sleep and play schedules? This piece was originally published in 2010.